Recently, Berna Romulo Puyat has been quite visible. 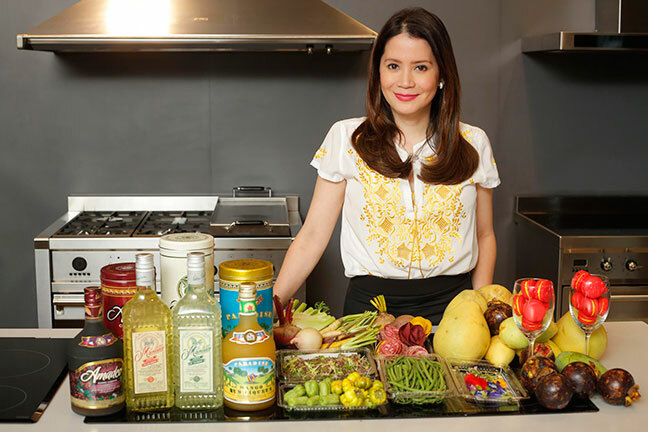 She has been on the forefront of the movement to bring our local produce into the mainstream. She was also a major proponent of the recently concluded Madrid Fusion Manila. From what we personally witnessed, her hard work was one of the reasons that the event was a success. Berna always says that she is not very knowledgeable about food and wine, but her passion for her work and for life in general overshadows it all. Let us take a look and see what makes her tick. Please explain to our readers what your job as Undersecretary for the Department of Agriculture entails. As the Undersecretary for the Department of Agriculture (DA) for Special Concerns, I am in charge of special sectors in agriculture such as our women farmers, indigenous people, youth, senior citizens, persons with disabilities, and cooperatives. I am also the Alternate Chair of the National Organic Agriculture Board (NOAB). I go all over the country to meet with our farmers belonging to these sectors and explore ways on how we can help them. At present, we have been distributing planting materials and postharvest facilities. We also conduct trainings on farming techniques and livelihood skills to augment their income. We link our farmers with institutional buyers and showcase their products in local and international trade and culinary shows in order to expand their market overseas. This is one way of encouraging our farmers to continue producing their crops knowing that there is a ready market for them. What were you doing before your stint as DA Undersecretary? For 14 years, I was a lecturer at the School of Economics, University of the Philippines, Diliman. I taught Econ 11, macro, micro and Public Economics. Then I became a deputy cabinet secretary for about 5 months before I was asked to join the Department of Agriculture as an Undersecretary. Tell us about your role in making Madrid Fusion a reality. It was Margarita Fores who suggested to the Deparment of Tourism that the Department of Agriculture should involved with Madrid Fusion. We were in charge of the regional lunches where we asked our local chefs to use local ingredients like Adlai, heirloom rice, coconut byproducts, seafood, cacao, carabao’s milk etc. We wanted to show our foreign guests how good our local cuisine is and that we weren’t just limited to balut (although I do love balut). We were also in charge of some of the food tunnels (heirloom rice, cacao and local cheese). We also had a booth during the exhibition were we showcased ingredients only found in our country such as batuan, suwa, barako, Adlai, heirloom rice etc. We also showcased agri products which we liked to call our “rising stars” such as pili nuts, calamansi, dalandan, pomelo , cacao and coffee. Your current job takes you to different parts of the country. What are your favorite areas? A lot! One of my favorites is Negros Occidental not only because it is the ONLY organic province in the country but their food is delicious! I’ve been there more than a dozen times and i always find a new organic farm to visit or new dishes to the try! You can also find Danjugan Island. It is a marine reserve and wildlife sanctuary. I also enjoy visiting CAR (Cordillera Autonomous Region) because of the beautiful rice terraces! 90 percent of the rice farmers are women and every time you buy their heirloom rice, you save our rice terraces. We normally take for granted the rice we eat, but you value it more after planting and harvesting with our farmers. Plus the view is simply breathtaking! I also love Isabela, Bukidnon , Davao, Batanes, Cebu, Bohol, Agusan…….too many to mention and to explain why I enjoy visiting these provinces but basically each province has something unique to offer. So far what part of your job brings you the most fulfilment? I know it sounds like a cliché, but it makes me happy when I get to help our farmers. When I visit them and see how hard their lives are, it just put things into perspective. After talking to them, it makes me want to help them even more. When typhoon Yolanda hit Leyte and Samar, we immediately visited them to distribute vegetable seeds and seaweed implements to our women farmers. I went back a few months after and I was pleasantly surprised to see they already had organic gardens. I also saw our women beneficiaries collecting seaweed using what we gave them a few back and I was so happy when they told me that they were now earning by selling the seaweed. They kept saying thank you and I cried because they were able to put to good use what we gave them. It showed me their determination to rebuild their lives after such a disaster. I know that you have always said that you are not a connoisseur of food and drink, (she just loves to eat) but what are your favorite restaurants here and abroad? You forgot to say that I’m also allergic to alcohol! Haha! I love going to Terry’s because their food is consistent and its comfort food for me.Plus JC is such a perfect host. Green Pastures because I love how innovative Chef Robby with all his dishes and he tries as much as possible to use local ingredients. He recently had an umami salad using Adlai. Grace Park. I also love the fact that Gaita also uses local ingredients from our organic farmers. My ultimate favorite is her avocado pie specially when it’s in season! Mecha Uma, because Bruce always surprises me with his dishes! I have not had the same meal at his restaurant even if I always go there. Wildflour because I love their salads, desserts and they always have something new in their menu. Asador Cristobal in Madrid. The best asado cordero I’ve ever tasted. That’s one restaurant I always go to when I visit Madrid. Joel Robuchon in Paris. Everything they serve me is simply delicious! Semilla also in Paris. They change their menu everyday so there’s always something to look forward to. Amber in Hong Kong! I attended a four hands dinner of Chefs Richard Ekkebus and Corey Lee! I actually went for Corey Lee but the dishes of Chef Ekkebus did not disappoint! No wonder Amber is number 38 in the worlds 50 best restaurants. Durumzade in Istanbul,Turkey. I only tried it because Anthony Bourdain suggested it in one of his shows. I ended up going there thrice! It’s a hole in a wall, which for me serves the best kebabs! Pamana (for their Crispy Pata), Milky Way (I still think they make the best guinumis in town) or Sentro 1771 (for their Sinigang Corned Beef). Although one time, one of the winners of top chef came to Manila and he was treated to a home cooked dinner by one of my best friends and he loved it! Sometimes home cooked meals are really the best. Is chocolate considered junk food? If yes, then that’s what I can’t resist! Mix of both Filipino and Foreign dishes! Since it’s my last meal, I will list down all the dishes I love without worrying I will gain weight after. I will probably take a bite of each so I can eat everything! Insalata di Gorgonzola from Cirkulo! Para healthy! The organic Lechon de Leche from Isabela. Not to much fat but simply delicious. It blew my mind away when they served it the next day as Paksiw! Simply delicious! Organic lamb of Enting’s of Sagay! So tasty even without sauce! I tried his lamb during Madrid Fusion and when I visited him a few weeks ago, he made me try his organic lamb barbecue! Again when you have good meat, you really don’t need much seasoning. Cordero Asado from Asador Cristobal. The last time I went there was with Chef Claude and Chef Bruce and they said it was only seasoned with salt. I couldn’t believe it because the lamb was just so good! Again, if you have good meat, there’s really no need for too much seasoning. Matsusaka beef from Japan! I love the one from Tsukiji Satou and M Yakiniku in Osaka. Dinuguan. A lot of people love it but maybe I just haven’t eaten one that I liked. As far as we know, your term as Undersecretary ends next year. Between us, what are the future plans for Berna Romulo Puyat? That depends on who the next President and Secretary of Agriculture will be. You’re only as good as your boss. I was actually toying around with the idea of retiring in 2016 when Pnoy’s term ends. I will probably work with an NGO or do CSR for a company if anyone will take me!